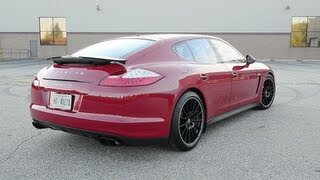 The all-new Porsche Panamera GTS 2012 is the purist member of the Porsche Gran Turismo family. A powerful 430 hp 4.8-litre V8 engine with Sound Symposer sits under the bonnet of the Panamera GTS. This uprated naturally-aspirated V8 engine produces 520 Nm of torque at 3,500 rpm and aids the car to shoot from 0 to 62mph in just 4.5 seconds; and a top speed of 179mph. The car goes on sale in February 2012 with pricing starting at £90,409. 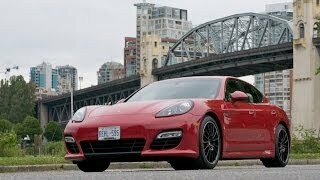 The new Panamera GTS is the purist member of the Porsche Gran Turismo family. A powerful V8 engine with even more intense responsiveness sits under the bonnet, the sporting chassis has been tuned for added dynamism and agility and the distinctive exterior styling clearly signals these focused intentions. The heart of the new Panamera GTS is its uprated 4.8-litre naturally-aspirated V8 engine benefiting from numerous modifications to give it even better performance. The 30 hp higher engine output and 20 Nm greater torque (compared with the power units in the Panamera S/4S), results in the GTS producing 430 hp at 6,700 rpm and 520 Nm at 3,500 rpm. For maximum performance, the muscular V8 drives all four wheels via a seven-speed Porsche Doppelkupplungsgetriebe (PDK) transmission. The four seater GTS has a kerbweight of 1,920kg and can accelerate from 0-62mph in 4.5 secs, and on to a top speed of 179mph. Combined fuel consumption on the NEDC is 25.9mpg, and CO2emissions are 256g/km. At the push of a button, driver and passengers can hear the engine of the GTS ‘breathing’; the Sound Symposer directs intake noise into the interior at the push of a button. This is achieved by an acoustic channel picking up the intake vibrations between the throttle valve and air filter. The acoustic channel incorporates a membrane that transmits the vibrations as an engine sound into the A-pillar. A controllable valve located in front of the membrane enables the Sound Symposer to be activated or deactivated by means of the Sport button. The exhaust gases exit the Panamera GTS through the standard sports exhaust system, which comes with larger pipe diameters to reduce back pressure. This also contributes to the increased engine output: the sports exhaust system features two tuning flaps, which expose additional exhaust openings, thereby emitting an even more powerful sound. The flaps are controlled by means of a switch in the centre console, which features a “last mode” function that remembers the last setting and restores it when the engine is started. The Panamera GTS features a tuned chassis boasting performance-oriented options fitted as standard. For example, adaptive air suspension combined with Porsche Active Suspension Management (PASM) increases both comfort and driving dynamics by adjusting the spring rate and electrically adjusting the damping system, combined with a self-levelling height adjustment function. With the air suspension at its normal level the Panamera GTS sits 10 mm lower than the other models in the Panamera range and its damping is designed to be tauter, reinforcing the sporting personality. Dynamic performance is further enhanced by the combination of 19-inch diameter Panamera Turbo wheels, 5 mm rear wheel spacers and larger brake discs from the Turbo – recognisable by their red brake callipers. The Panamera GTS is equipped with the Sport Chrono package as standard, which in addition to the Normal and Sport modes offers the Sport Plus programme as well. Specific characteristics of the Panamera are further accentuated depending on which mode is selected, which tailors the responsiveness of the engine, transmission and chassis according to the driver’s preference. In the ultimate Sport Plus mode, the adaptive air suspension lowers the vehicle to the low setting and switches to a harder spring rate. The rear spoiler angle of attack also changes to the performance-oriented setting. 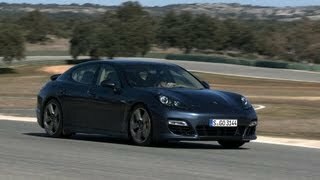 Porsche Dynamic Chassis Control (PDCC) is the final level of development of the Panamera GTS chassis, twinned with the electronically-controlled rear axle differential lock and PTV Plus. PDCC limits body roll when cornering by using active anti-roll bars on the front and rear axle. This results in improved agility, performance and comfort. The driving dynamics benefits of PDCC are enhanced further by Porsche Torque Vectoring Plus (PTV Plus). The system works by varying the torque distribution to the rear wheels and by employing an electronically-regulated rear limited slip differential, which manages traction as well as optimising the car’s steering precision. Identified by its large air intake openings, the GTS features the standard front section of the Sport-Design package of the Panamera Turbo which emphasises the sporting character as well as ensuring the air supply for the engine. This sense of purpose is matched at the rear by the adaptive four-way rear spoiler from the Panamera Turbo. At speeds above 127 mph it generates downforce on the rear axle, thereby ensuring stable driving safety at high speeds. The appearance of the Panamera GTS is characterised by numerous black exterior styling details. The high-gloss black exterior package comprises the side window trim, the decorative trim on the rear lid, the headlight washer unit cover, the rear diffuser and the side air outlet panels, lends a particular sporting touch. In combination with the black side skirts, the tail end and the matt black tailpipes of the sports exhaust system the result is clear-cut and striking. A further point of differentiation is Bi-Xenon headlights with black inner bezels. These feature four LED daytime running lights each, which – as with the Panamera Turbo – are located in the main headlight for a distinctive look. The optional body colour of Carmine Red, available exclusively for the Panamera GTS, emphasises the overall sportiness of the model and provides an ideal contrast with the black exterior accessories. An ambience of leather and Alcantara – with a choice of five interior colours – ensures the personality of the Panamera GTS is expressed throughout the interior. The centre panels of the adaptive 18-way adjustable sports seats, the upper sections of the door armrests and front centre console armrest and roof lining are in Alcantara. The SportDesign steering wheel with PDK shift paddles and twelve o’clock marking on the steering wheel rim combines dynamic looks and sporting functionality. To ensure clear differentiation, the stainless steel front door entry guards feature ‘Panamera GTS’ lettering. ‘GTS’ lettering is also shown on the instrument cluster and on the embroidered headrests. Furthermore, the agility of the Panamera GTS is made apparent via the lateral and longitudinal acceleration display in front of the driver. The display on the right hand side of the instrument cluster – and on the Porsche Communication Management (PCM) system – relays information regarding the instantaneous acceleration, thereby reflecting the potential of the driving performance of the Panamera GTS. Porsche has put together special optional equipment packages married with a black interior, exclusively for the Panamera GTS. The decorative stitching on the foot mats, top of the dashboard, upper edge of the door, armrest, door trim and centre console, the door closing handle along with the seat stitching are executed in Carmine Red or GT Silver. The embroidered ‘GTS’ lettering on the headrests, and seat belts also in the corresponding colour, complete the overall impression. The Porsche Panamera GTS will be on sale in the UK from February 2012, priced from £90,409. Every Panamera, including the new GTS, has a high level of standard specification that includes front and rear ParkAssist, Porsche Communication Management with touch-screen satellite navigation and audio controls, cruise control and a three year warranty. Fitted to every Panamera GTS is a Porsche Vehicle Tracking System (VTS), a sophisticated vehicle security package approved to Thatcham Category 5 standard, and customers will also be able to explore the potential of their new car by participating in a complimentary course at the Porsche Experience Centre, Silverstone.